Ryan Holbrook (far left), head of the entrepreneurship program in the Nazarian College, and business leader and CSUN alumnus Jeff Marine (far right) present members of the Vibe Probiotics team — from left, Abed Rahman, Erika Elizalde and Katie Teevin — with a check for $25,000 at the 2016 Bull Ring Finals. Photo by Luis Garcia. The second annual California State University, Northridge Bull Ring New Venture Competition kicks off this spring, with students pitching their innovative ideas for business startups — in hopes of winning part of the $60,000 purse. The competition is co-hosted by CSUN’s David Nazarian College of Business and Economics and the university’s on-campus branch of the Los Angeles Cleantech Incubator (LACI@CSUN). 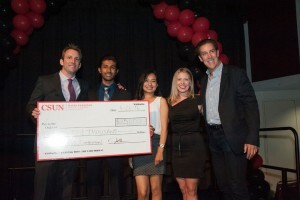 The contest connects teams of entrepreneurial CSUN students with business professionals, executives, experienced entrepreneurs and experts in various fields. Twenty semifinalist teams will be selected shortly after the March 5 application deadline, followed by a four- to six-week “incubation period” from mid-March to late April. During this time, local business and CSUN faculty mentors will help students refine their business models and master the art of the “pitch” for a trade show-style semifinals event. If they advance further, students also will participate in a final event modeled after the hit ABC TV show “Shark Tank.” The semi-final event will take place on April 4 and the finals will be held on May 2. The first-place team in the final competition will win $20,000 to fund its idea, while the second- and third-place finishers will receive $10,000 and $5,000, respectively. Additionally, each of the 20 semifinalist teams will receive $250. The collective $60,000 in prize money is one of the largest award sums for this type of student competition in California, according to Ryan Holbrook, director of the Nazarian College’s Entrepreneurship Program. Holbrook said the competition experience and potential cash rewards provide aspiring entrepreneurs with the tools and knowledge necessary to bring their ideas to life. The cash prizes are sponsored by Jeff Marine, a CSUN alumnus who founded and serves as CEO of JEM Sportswear and Awake, Inc. — apparel manufacturing companies headquartered in San Fernando. Marine will serve as keynote speaker at the contest’s final event. “I chose to get involved with CSUN’s Entrepreneurship Program because it’s an opportunity for me to really make an impact on empowering our students to think big — both about themselves and about their careers,” Marine said. Vibe Probiotics, a startup that produces beverages containing probiotic bacteria — microorganisms with health benefits — won first place in last year’s Bull Ring Competition. The company also devotes a portion of its earnings to developing probiotic formulas for children who suffer from malnutrition and dehydration in impoverished regions. Abed Rahman, Vibe Probiotics’ CEO and co-founder, led the winning 2016 team. Rahman, a CSUN alumnus who graduated with a bachelor’s degree in management in 2015, said the most valuable lesson the competition taught him was to always plan ahead. The student teams will be judged by an elite group of business professionals, including LinkedIn co-founder Allen Blue, PCS Development CEO Paul Jennings, COACCEL co-founder Cam Kashani, R6S CEO Ash Sobhe and Enplug CEO Nanxi Liu. The feedback and mentorship from successful entrepreneurs is key to the competition, Holbrook said. Tim Tiemann — a seasoned entrepreneur who has worked with many startups in the biotechnology industry and consults as an entrepreneur-in-residence at the University of California, Los Angeles — mentored Rahman and the Vibe Probiotics team during the 2016 competition. Tiemann called the experience a stellar opportunity. In addition to the prize money, the top three finishers will receive legal startup services courtesy of Bull Ring Competition partner DLA Piper, and marketing services donated by SKY, a self-described “psychological brand design studio.” They also will be awarded a three-month trial membership to LACI@CSUN — a business incubator partnered with CSUN that was ranked third by UBI Global on its list of World Top University Associated Business Incubators in 2015. Business incubators are companies that help startups develop and expand. Headquartered in downtown Los Angeles, LACI has an office at CSUN dedicated to helping entrepreneurs from CSUN and the greater San Fernando Valley develop and launch their startups. LACI provides companies with mentors, advisors, office and conference space, access to its prototyping facilities and an oversight engagement period that typically lasts five years. The Bull Ring Competition is open to all current CSUN students. Teams are required to have a minimum of two members, and at least 50 percent of team members must be current CSUN students. For more information about the CSUN Bull Ring New Venture Competition, please visit www.csunbullring.com or contact Ryan Holbrook at ryan.holbrook@csun.eduor (818) 677-4510.